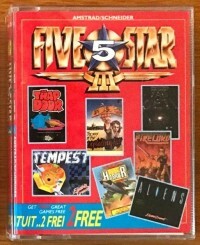 THIS compilation is the third in a series of five-game collections from distribution giants Beau Jolly. This time two extra games are included, in effect for free. Way of the Exploding Fist is one of the best martial arts simulations I have played on the Amstrad. With joystick or keyboard and one or two player options, the program offers a great range of moves, from crunching high kicks that bring tears to your eyes, to punishing body blows, outrageous back flips, and sneaky trips. With just the one scenario and no objective other than to win the contest, the game relies on the quality of action, the range of moves, kicks and defences, and excellent graphics to keep you amused. I think most gamers would prefer this to some half-baked plot tacked on to an inferior contest. The one-player mode features a computerised opponent good enough to provide the right degree of challenge. Each contest is timed and each successful action is graded according to its complexity. At the end, a Buddha-like figure decides the winner. Trap Door is not up to this standard. On paper, the idea of a large character - Berk -bumbling around various colourful screens manipulating trap doors, lifts and a variety of other mechanical devices to please his master seemed good. Indeed, for the few first moments the program looked promising. The option to play a trainee Berk without ghosts and ghoulies to bother you is a good idea, as are the large chunky colourful characters and objects. Berk is especially large colourful and stupid, but I don't think ignorance can be blamed for the jerky screen movements, poor response and lethargic action that results. 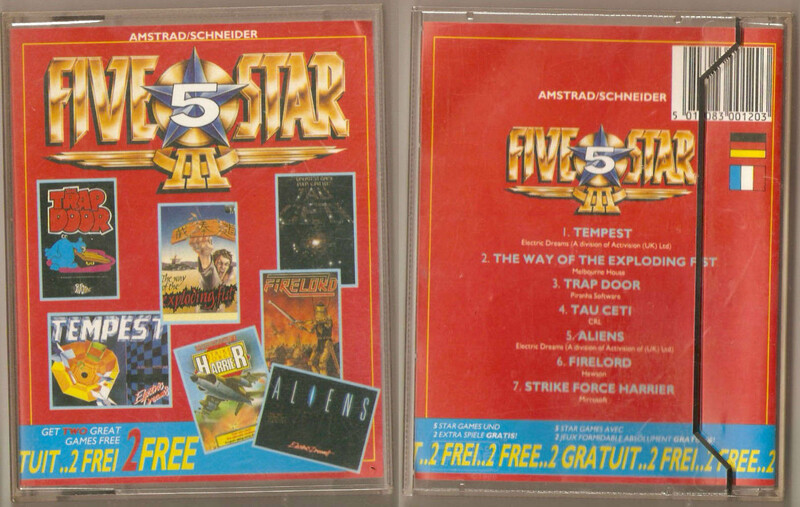 Tempest, originally from Electric Dreams, is a fairly faithful version of the old arcade game. For the uninitiated, Tempest places a shape on the screen cut into a number of sectors. Along these travel a varying selection of malevolent creatures, each with its own movement patterns. You must move round the tops of the segments firing laser bolts in an attempt to prevent the creatures from reaching the outside where they will be hellbent on destroying you. Each level consists of a different shape and a differing selection of creatures. The provision of bonus lives for destroying green spinners greatly aids your progress through the first half dozen levels. I don't know how many screens there are to this infernal game, but I managed to reach level 13 with a score of over 50.000. If I can do that, I imagine most people could double it. Strike Force Harrier is an interesting simulation of flying a Harrier, admittedly without getting the chance to sample its vertical take-off ability. Some elements of the theory of flight are avoided or simplified so that you can quickly get to grips with flying the machine and concentrate your efforts on missions, avoiding attacks, and acting decisively when confronted with a missile attack or other hostilities. I was proud of my barrel roll and loop, but my ability to complete a full successful mission is another thing. The game certainly holds the attention for a decent length of time and was one that I enjoyed most. Tau Ceti and Aliens are both interactive arcade adventures, Tau Ceti putting more emphasis on problem-solving than Aliens. This latter is based on the film sequel to the popular space horror/thriller. Alien. It depicts the six crew members headed by the first film's only survivor, Ripley. They wander around their craft putting paid to any attempts by the warrior or face-huggers to kill them and take over the ship. You can switch between characters, and the game is graphically effective, though not an inspired piece of programming. One feature of note is the programmer's attempt at mimicking ye olde Spectrum loading system. Unfortunately, the result also seemed to mimic the Speccy's slowness and lack of reliability. 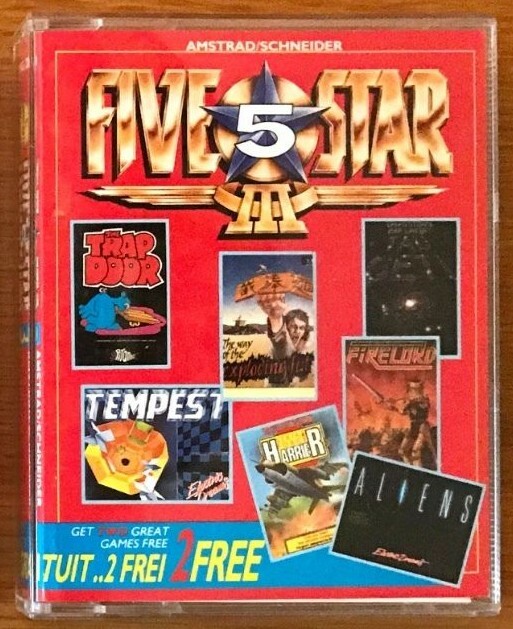 Five Star Games III is a package definitely worth considering. Certainly, as a birthday or some other sort of present, its appeal will last because of the wide variety of games on offer. Several show their age and would find a lot of competition from current versions sold under a budget banner. However, the inclusion of quality programs such as Tau Ceti, and Beau Jolly's masterstroke. Way of the Exploding Fist, make this collection amongst the best on offer at present.